Winners announced May 18, 2018. If you live in another region, I would love to show of the nominees, but there is not way for me to view another regions Crystal Kite Award nominees. Please send me a screen shot, so I can add your region. THANKS! YOU MUST GO TO SCBWI.ORG and sign in. 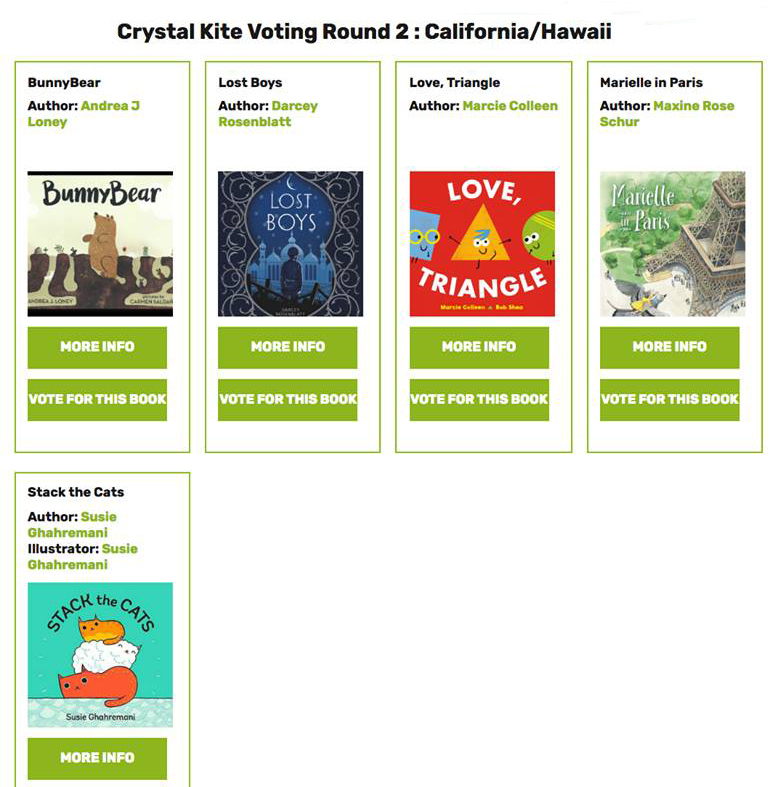 Look for the Crystal Kite Award on the left side bar and click to vote. Remember to send me the other region nominees. I know I like to see the books to consider reading. I’m sure I am not the only one. Thank you Marcie Colleen for sending it this screen shot. 1. You must be a current member to vote prior to voting opening. 2. You may only vote once per voting round. Check out the Frequently Asked Question Page which includes voting instructions. Still have questions? You can e-mail Christopher Cheng, our SCBWI Crystal Kite Member Choice Award Coordinator. Posted in chapter books, children writing, Competition, Contest, Middle Grade Novels, Non-fiction, picture books, Young Adult Novel | Tags: Crystal Kite Award Voting, SCBWI, Vote Now!